In reviewing material for the “BOCC on the Record” posts, I came across some discussion of the funding disparity issue at the October 2013 Board of County Commissioners (BOCC) meeting. It’s garbled and distorted, of course. If you’re looking for clarity, you certainly won’t find it at a BOCC meeting. But still, the commissioners who attempted to discuss the issue in a serious way deserve some credit. Kolhage basically refused to address the issue. When it was raised, he quickly changed the subject back to more spending. Carruthers became confused about the sales tax and the contribution to the county from incorporated areas versus unincorporated areas. Rice raised the issue of parity for the municipalities. A valid point! Murphy did a good job outlining the issue. Neugent brought up the issue of rates. Single family homes in Key Largo actually pay slightly lower rates than single family homes in the other unincorporated areas. I assume this is why Neugent was trying to bring rates into the funding disparity discussion. As is typical, the truth of the matter is much different from what is presented by the BOCC and county staff. Not only do the citizens have to pay for building the sewer projects, they’ve got to pay to operate them. Money for building the projects comes from non ad valorem assessments. Property owners will see that on their tax bill for the next 20 years or so. It also comes from state and federal grants. To a very large extent, it comes from the infrastructure sales tax. In Key Largo’s case, money to build the system also comes from rates. About $6-8 per EDU of the $33.60 per EDU base charge goes to debt service payments that the Key Largo Wastewater Treatment District (District) must pay due to the unfair funding disparity. Florida Keys Aqueduct Authority (FKAA) customers do not pay any capital costs out of rates. Zero. Their base charge is not based on the number of EDU’s either. It’s based on meter size. That’s the first difficulty we run into when comparing rates for the two entities. There’s been some talk lately of the Florida Keys Aqueduct Authority (FKAA) taking over Key Largo’ s system. It’s died down some thankfully. But Key Largo ratepayers need to be very cautious. Theoretically, it would make sense to consolidate the two entities. But at present, it’s a terrible idea. It’s bad enough that Key Largo taxpayers and ratepayers are subsidizing the construction of FKAA systems to a grossly unfair extent. We definitely do NOT want to subsidize operations, too. And that’s exactly why I think there’s been talk of FKAA taking over the District. Construction tails off eventually. Operations is forever. Not only were FKAA systems expensive to build, they are expensive to operate. Some of this is because of the nature of the service area. But much of it boils down to the FKAA’s own decisions, and Monroe County’s failure to examine the county-wide financial impact of those decisions. The FKAA built multiple small plants rather than consolidating. These plants are not standardized on one treatment technology, which increases the operating difficulty and expense. When FKAA switched from low pressure to gravity, they opted for lift stations with three or four pumps rather than the typical two. Rumor has it that some of these lift stations will have up to eight pumps. I certainly hope that is not true! It’s no surprise that FKAA might be looking to swallow up a more efficient system to subsidize operating costs. So do District customers really pay lower rates than FKAA customers? Yes and no. As I said, the two entities have different rate structures so it’s not a straightforward comparison. I’ve provided graphs below which compare how much customers pay under various scenarios. 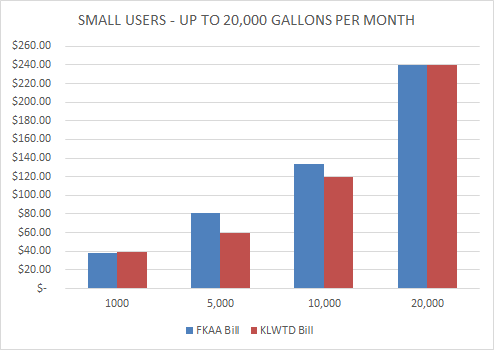 Customers who use less than 20,000 gallons per month will generally pay less under the District’s rate structure. 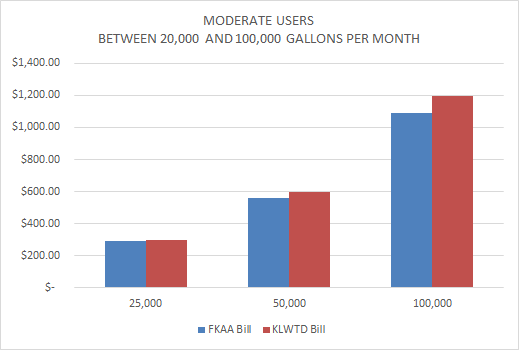 Users with very low water use, like Bob Dean, for example, will actually pay slightly more than they would under the FKAA rate structure. Single family homes with normal flows pay about $15-$20 less per month. Moderate users, those who use between 20,000 and 100,000 per month, will pay up to $100 more per month under the District’s rate structure. These are typically the local businesses – smaller hotels and restaurants. I wonder what Comm. Neugent would say to these folks about rates. They are his constituents. 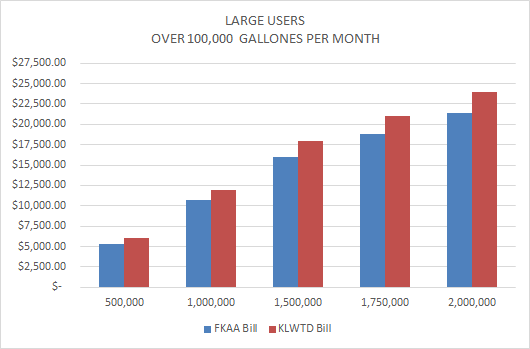 Large users, those who use over 100,000 gallons per month, will pay substantially more – up to $2000 per month more – under the District’s rate structure. These are the large businesses, typically hotels. This is the funding disparity at work again. Debt payments are a fixed cost that must be passed on to the customers. The lack of funding forced the District to borrow against rates to pay for the Key Largo project. That is why the District’s base charge is substantially higher. It is yet another manifestation of the excessive financial burden imposed on Key Largo by the BOCC’s grossly unfair funding decisions. The BOCC has known about this problem for over four years now – at least. I can personally attest to that. I know others who came before me raised the issue as well. Why hasn’t it been fixed yet? When will it ever be fixed? How was it allowed to happen in the first place? I really like my numbers and I can’t be the only one, can I? Here’s a table for us nerdy types. This entry was posted in BOCC, Bubba System, FKAA, Key Largo Wastewater Treatment District, Key Largo's contribution, KLWTD, Monroe County, Wastewater. Bookmark the permalink.